Ever since I wrote my piece stating that UMass needs to making a coaching change at the end of the season I’ve had many people ask who would be my potential candidates to lead the program to success. There are a few prospects that immediately come to mind. There are a few that I wish they had looked at the last time around when the coaching position was open in 2012 and either they weren’t interested, then Athletic Director John McCutcheon didn’t consider them, or the timing just wasn’t right for either side. I’ve already heard a lot of suggestions from readers and fans on who should be considered and I’ve done my best to take them into account. With their loss at Northeastern over the weekend Boston College will not be coming into the Mullins Center on Friday as the top ranked team in the country. Instead they’ll be coming in as the third ranked team according to this week’s USCHO poll, but still a team receiving first place votes. Either way they’ll still be a very formidable opponent for Massachusetts, who has a number of areas to work on after last Friday’s victory against UConn. Half of Hockey East is currently ranked as Lowell drops to #10 after tying Vermont, Boston University is right behind them at #11, and Northeastern and New Hampshire join the poll at 14th and 15th respectively. In addition Maine, Merrimack, and Providence are also receiving votes. UMass still hasn’t gained back the votes they had prior to their unfortunate loss to….UMass in the pre-season scrimmage. Minnesota is tops in the USCHO poll as well as the USA Hockey/USA Today poll. Quality wins over Merrimack and BC deservedly gave Northeastern a couple spots in this week’s Hockey East Awards. How half-assed is the UMass representation on the linked release? Brendan Gracel is rightly recognized as a Top Performer for his one goal and one assist performance, but not Steven Guzzo who had equal statistics and a highlight goal? Only a single sentence devoted to UMass’ Team Notes? The Collegian has some notes from Friday’s game to go with their recap which I believe originally ran Saturday. The Collegian’s Nick Canelas is pulling double duty this season as he’s also contributing to College Hockey News, like with this piece on how this past Friday’s matchup will likely blossom into a conference rivalry in the near future. So if you happen to be a UMass hockey fan in the Carolinas, the Bi-Lo Center has become Mullins South. Masslive’s Harry Plumer noted on his Twitter account earlier today that with Danny Hobbs being sent down to the ECHL’s Greenville Road Warriors he’ll be reunited with someone he has skated alongside for the last four years with in Mike Marcou. The coach of Greenville? None other than former Minuteman captain Dean Stork. Nice to see Nebraska-Omaha taking steps to bring Maverick hockey on campus. And then there was one. With Oleg Yevenko’s Fargo Force getting swept at the hands of Shane Walsh’s Duquesne Fighting Saints in the second round of the USHL playoffs, Walsh is now the only UMass recruit still playing this season. Here’s hoping that Walsh and the Saints bring home the Clark Cup! Walsh went scoreless in the two playoff games in which he saw action. Yevenko had 4 PIM and no points in his three playoff games. Very little UMass hockey or even general college hockey news as of late. Greg Cronin was leaving Northeastern. And then he wasn’t. Meanwhile the man who took over at Princeton for Len Quesnelle, who took over for Toot Cahoon is now the first ever head coach for Penn State. In alumni news, Jon Quick had some amazing games for his Kings, including a shutout and a 51 save effort, but he and his teammates were not able to overcome the 2nd seeded Sharks in the Stanley Cup Playoffs. Justin Braun saw one game of action for San Jose and hopefully will see more as the Sharks continue towards the cup. In the AHL Casey Wellman’s Houston Aeros have moved onto the second round where they’ll take on the Milwaukee Admirals. Wellman had a goal and assist in the first round. David Leaderer is still on the roster for Milwaukee but didn’t see time in any playoff games so far. Alex Berry’s Norfolk Admirals were eliminated by the W-B Penguins. Dean Stork coached his Greensville Road Warriors to the 7th game of the second round of the ECHL playoffs, but they fell there to the Wheeling Nailers. Still, this season represented an amazing start to Storker’s head coaching career. Nothing hockey related, but there’s a ton of action on campus this weekend. Everything starts with senior night for lacrosse tomorrow as Garber Field is illuminated for a rare night game. Tailgating is being encouraged before the game (though, I didn’t really need the encouragement). UMass softball will have the second of a key series against Fordham at noon on Saturday which will lead into another tailgating opportunity before that evening’s spring football game. All are great opportunities to head back to the valley and hang with old and new college friends. First off, a big congratulations and thank you to Athletic Director John McCutcheon and Chancellor Robert Holub for doing what others would only talk about. UMass is set to announce it is upgrading its football program to FBS where they’ll play in the MAC. It’s been a dream of mine, and many others, to see the school play at the highest level of collegiate football. While I focus primarily on hockey (and beer) on this blog I’m also a season ticket holder for football, attending every game and have followed the team in its travels from Ann Arbor to Chattanooga. This is tremendous news and will only make the athletic department, and thus the hockey program, better as a whole. Walsh’s Saints had a first round by in the USHL playoffs but will take on Oleg Yevenko and the Fargo Force in the second round. Yevenko was suspended for the first round of the playoffs but is due to return against the Saints. In alumni news Jon Quick and Justin Braun and their Kings and Sharks will play Game 3 tonight, with Quick coming off his first ever playoff shutout. In the AHL Casey Wellman has a goal and an assist while his Houston Aeros are up 3-0 in their series over Peoria. Alex Berry’s Norfolk Admirals are up 2-0 on the Wilkes-Barre Penguins but he appears to be out for injury or something. David Leaderer hasn’t played for the Milwaukee Admirals who are tied 1-1 with the Texas Stars. In the ECHL coach Dean Stork’s Road Warriors are tied at one apiece in the second round of the playoffs there. It appears that Lowell has found their next coach. Hope everyone enjoyed Saturday’s National Championship game. A game winner in overtime, it certainly doesn’t get anymore exciting that that. Congratulations to the Minnesota-Duluth Bulldogs for their victory! The final rankings for the NHL Draft were released today by the NHL’s Central Scouting Service. The Minutemen had two players on the list with Mike Pereira ranked 114th among North American skaters and incoming freshman Joseph Manno ranked 145th. Pereira’s rank improved from a mid-season rating of 135th while Manno was previously unranked. Pereira was ranked 63rd in last year’s final rankings, but went undrafted come draft day. I’ve heard a couple different reasons as to why he wasn’t picked; one that he was injured and had to limit his participation when he went to the NHL combine and the other that teams were concerned with his strength. Whatever the reason, I really hope he gets to hear his named called this year. As a freshman he put up numbers as good or even better than BU’s Charlie Coyle, a first rounder at last year’s draft. I’ve also heard that Pereira has put a lot of time in at the weight room, which hopefully together with how he performed on the ice will make the difference for him this year. Zack Phillips, who committed to UMass before jumping to the QMJHL, was rated as the 15th best North American forward and will likely go towards the end of the first round. It’s playoff time in pro hockey and a few Minutemen will be key parts of their teams’ postseason success. UMass’ two NHL representatives will actually be facing each other in the first round of the Stanley Cup Playoffs as Jon Quick and the L.A. Kings will be taking on Justin Braun and the San Jose Sharks. This will be Quick’s second NHL playoff appearance when he takes the net for the seventh seeded Kings. In the AHL Greg Mauldin will be a part of the first ever playoff team for the Lake Erie Monsters, the second seed in the North Division, who will be taking on the Manitoba Moose. Casey Wellman and the Houston Aeros will be taking on the Peoria Rivermen in the first round. Alex Berry and the Norfolk Admirals will look to upset the East Division’s top seeded Wilkes-Barre Penguins. Also, I missed this last week but David Leaderer was loaned from the Albany Devils to the Milwaukee Admirals and could see time with them in the playoffs. No UMass players in the ECHL made the playoffs, but former Minuteman captain turned coach Dean Stork already has his Greenville Road Warriors in the second round in that league. 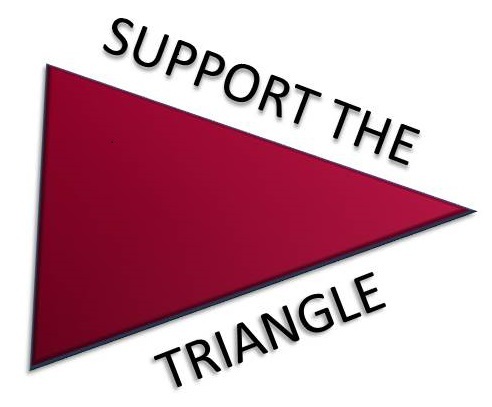 With my actual posting becoming less frequent make sure to follow Fear The Triangle on Twitter as well as like the Fear The Triangle Facebook page to keep up to date on all things UMass hockey. I’ll be sharing any UMass and general hockey news through those mediums that may not necessarily be worth a full blog post.